Implant treatment in individuals with periodontitis-associated tooth loss is frequently debated, because dental implants have become widely recognized as a treatment modality in patients with tooth loss. 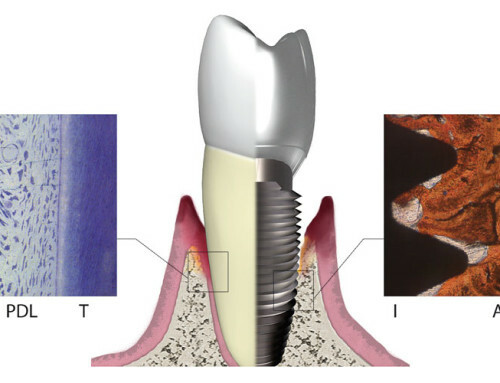 As an increasing number of patients receive implant therapy to replace missing teeth due to periodontal disease, the question arises as to whether the outcome of dental implants is influenced by a history of periodontitis. Periodontitis comprises a variety of pathologic conditions that affect the health of the periodontium and is commonly seen in its chronic form. In general, patients exhibit gingival inflammation with destruction of tooth-supporting structures including the periodontal ligament, connective tissue, and bone. Aggressive periodontitis forms are characterized by rapid attachment loss and alveolar bone destruction in otherwise systemically healthy individuals. This patient population is believed to carry an increased risk for implant failure, increased probing depths, and progressive bone loss around implants. Because inflammatory periodontal disease is regarded as a leading cause of tooth loss in the adult population, the issue in regards to successful implant placement becomes a major consideration for the clinician in treatment planning patients with a history of periodontal disease. 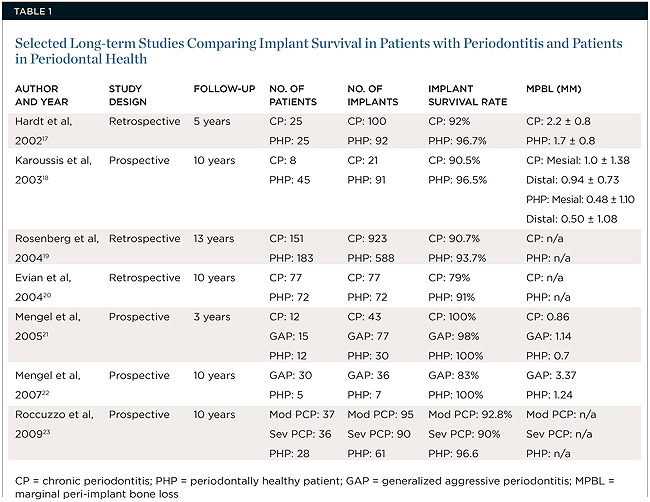 A 10-year prospective study conducted by Karoussis et al found that, although patients with a previous history of periodontal disease had a significantly higher incidence of peri-implantitis (28.6% vs. 5.8%) than their healthy counterparts, implant survival rates were still clinically favorable, with results of 90.5% seen in patients with a past history of chronic periodontitis compared to 96.5% in periodontal healthy subjects. 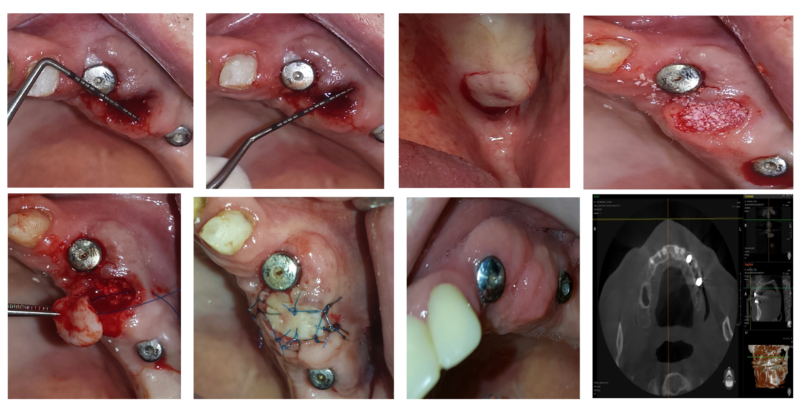 Implant placement in patients with a history of generalized aggressive periodontitis (GAgP) might be considered a viable option to restore oral function with survival outcomes similar to those found in both patients with chronic periodontitis(CP) and healthy patients (HP). However, the risk ratio for failure in patients with GAgP is significantly higher when compared with HPs and those with CP. 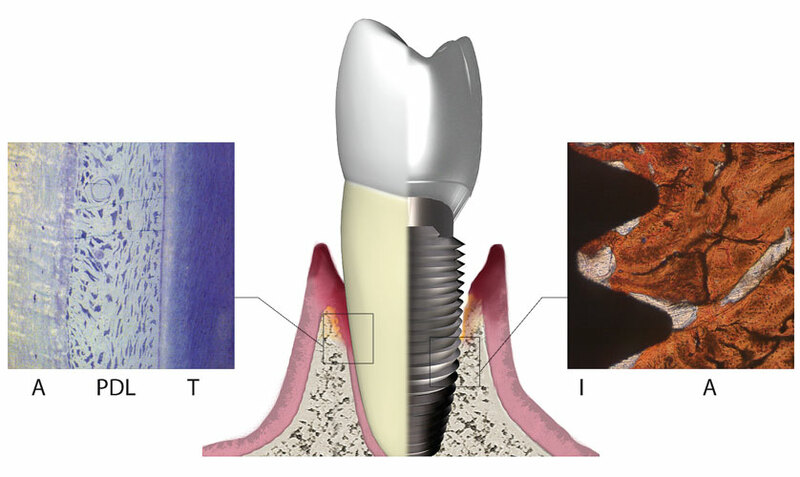 The literature currently indicates no significant difference in the rate of implant survival between patients with a history of periodontitis and periodontal healthy individuals after 5-year follow-up; however, studies show that patients with a history of periodontitis manifest greater probing depths, more marginal bone loss surrounding implants, and a higher incidence of peri-implantitis. 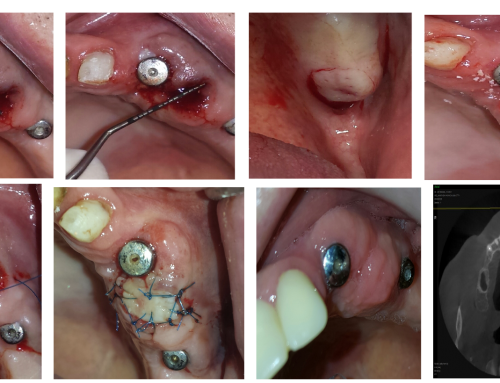 With carefully monitored supportive periodontal therapy (SPT) and proper management, clinical studies show implant survival at 5- and 10-year follow-up to prove dental implants to be a successful treatment modality with a predictable outcome. Patients with a history of periodontal disease should be informed that there is a higher risk of peri-implant disease. The survival of dental implants in this population was not significantly different from periodontally healthy patients. However, patients with a history of periodontitis demonstrate a significantly higher frequency of peri-implantitis and peri-implant bone loss. Supportive periodontal therapy seems to be a key factor in enhancing long-term implant survival. With proper management and patient compliance, the literature suggests that clinically acceptable results can be achieved when placing dental implants in patients with a history of periodontitis. However, there is a need for stronger evidence in the form of longitudinal studies in much larger samples in the future.